What I'm about to detail is sacrilege to many homebrewers, so let me preface this with some disclaimers. This will definitely oxidize your beer and make it go stale in a hurry. I probably didn't think this one up myself. Bike pump air may not be "sanitary." I am an incredibly cheap person. That refers to how much I like to spend, not how much I personally cost. If I wasn't, I'd just go ahead and buy a damn co2 tank. Now, on to the fun stuff. Have you ever bought a commercial keg for a party and used that tap with the hand pump on it to dispense it? If you're reading this blog, I'm going to assume that you have. Well, it is incredibly easy to fabricate something like this for your standard 5-gallon homebrew keg using a bicycle pump and some parts from Northern Brewer. Use a little ingenuity and you can have an entire kegging system with a fairly minor start-up cost. The only condition is that, like getting a commercial keg with a hand-pump tap, you'll have to finish your keg in a day or so, before it goes stale and flat. A used 5 gallon ball-lock keg. Used keg seal kit. Let's keep it clean, y'all. Foam-free tubing kit ball-lock version. 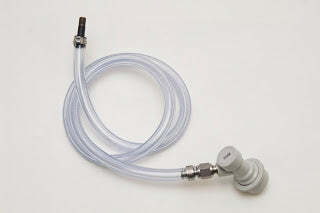 1/4" beverage tubing. For the gas side of things. 1/4" barb gas ball-lock disconnect. Worm gear clamps. You can tighten them with a screwdriver. A used bicycle tube with a Schraeder valve. This is the standard American bicycle tube. Bike shops will give you used flat tubes if you ask. All you want is the valve, so it doesn't matter if the rubber is busted open. To make the gas line, cut out the valve from the tube and then trim the rubber off of it. The 1/4" tubing should fit nicely over it and you can then clamp it down using the worm-gear clamp. Attach and clamp the other end of the tubing to the barb on the gas disconnect. Then simply hook a bike pump up to the valve to dispense the beer. With this equipment you can dispense your beer, but what about carbonating? Trust me, you don't want to try to carbonate your beer with a bike pump, but you can easily carbonate the beer the old fashioned way using priming sugar. And finally, don't forget to chill your beer down before serving so that it can absorb the appropriate amount of c02. Here in Minnesota we can often leave it on the back porch for a few hours at freezing temps or put it into a bucket with some snow and water. Warning: Keg stands not recommended for 5-gallon corny kegs, as they are not large enough to support the average homebrewer.